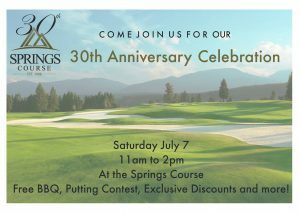 The Springs Course is going to be 30! To commemorate this milestone we will be having a birthday party including a FREE BBQ, live music performed by local Emma Kade, birthday cake and more…. This is an all ages event so bring the whole family out for a celebration, all members and public are invited. Although this is a free-event, we are offering exclusive discounts in the golf shop and special merchandise.